It’s finally here! 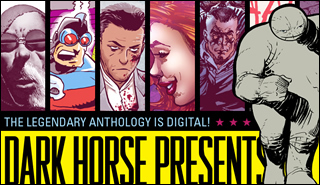 Dark Horse Presents is now available digitally! The legendary premiere anthology is back, and better then ever. Get seventy pages of comics for only $3.99! Be sure to pick up the print version of DHP #1, loaded with content not found in the digital version, and get DHP #2 on sale next Wednesday at your local comic shop! This, to me, perfectly summed up how schizophrenic comic publishers are about their digital comic efforts. They change immediately from “buy online, it’s a great deal” to “but you’re not going to get the full content”, clearly giving the message that print is what they really want to be selling. I understand the value of upselling — telling a customer who’s ready to buy “oh, here’s a better version (that makes us more money)” — but that usually applies when both products are available in the same venue. Someone who wants to buy a comic now on their favorite device isn’t, in most cases, going to change their mind, look up a comic store, get their keys, drive there, and pay more.